We are customer acquisition and expansion experts for the technology industry. Professional sales executives know that customers only do business with people they trust. In a mature industry with many competitors, that means you will only have a chance at penetrating a target account by becoming a trusted advisor to those who can bear influence on doing business with your company. 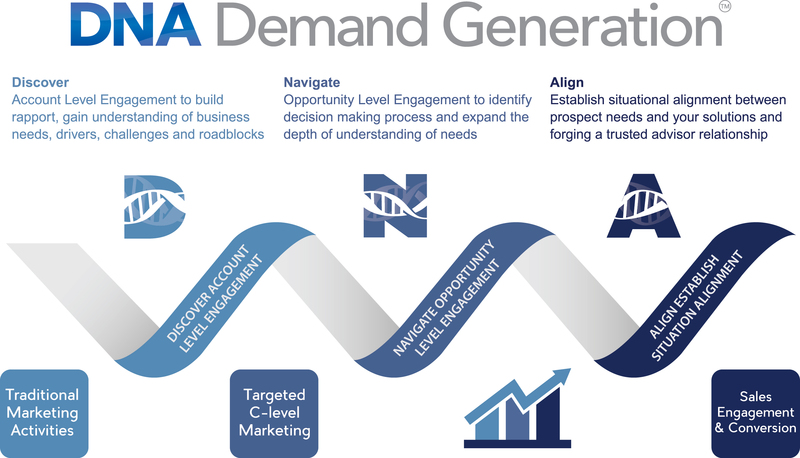 DNA Demand Generation™ is solution selling methodology driven by industry experienced sales executives who have a long track record of successfully building relationships on trust and value. We do this through our DNA Demand Generation ™ process of engagements that deliver highly qualified business opportunities with key decision makers that have begun to align their pains to your solutions. DNA Demand Generation ™ empowers marketing by qualifying and developing truly ‘sales-aligned’ business opportunities whereby customers have begun to align their needs to your solution. The results are business opportunities that your sales teams can then convert at much higher rates than they are currently delivering. We help sales and marketing leaders attain quota on-time by delivering sales-ready business opportunities that convert at significantly higher rates than traditional leads and appointments. There’s no secret or gimmicks to our process. Most lead generation firms rely on brute force and high volume. They employ inexpensive, poorly trained workers to chase as many prospects as possible. We take a far more intelligent approach. We take a far more intelligent approach. At the point of alignment how marketing engages customers should mirror sales. DNA Demand Generation ™ is the right approach delivered by solution-selling savvy sales executives that build trust with your customers. Our DNA Demand Generation ™ process for customer engagement and opportunity development starts with customer needs and then aligns these needs to key solutions. All business development opportunities start at the discover stage of the process. At this initial stage, our consultants are razor-focused on learning about your potential customer’s needs and priorities, not pushing any solution. This is a much more powerful way to forge a relationship. This is the step that most firms skip. The business intelligence gathered during the Discover stage will form the basis for determining the direction for the next level of engagement in the DNA Demand Generation ™ Process. The Navigate stage of the DNA Demand Generation ™ Process is designed to expand the level of business intelligence around qualified opportunities identified during the Discover stage. Armed with the details obtained during the Discover stage, our skilled consultants re-engage identified decision makers with a direct role of influence on the identified business opportunities. The goal is to strengthen the rapport and expand the depth of understanding around the challenges, roadblocks and drivers related to the identified business opportunity. With an in-depth understanding of the customer’s pains coupled with a clear line of visibility into the decision-making process related to the business opportunity, our trained consultants can begin to formulate the direction for the next level of engagement in the DNA Demand Generation ™ Process. The Align stage of the DNA Demand Generation ™ Process is designed to help establish a situational alignment between your solutions and the key decision-maker needs. During this critical stage in the sales process our trained consultants will work with you sales teams to position your solutions based on the business intelligence gained during the Discover and Navigate stages of the DNA Demand Generation™ Process. Your solutions will have a better likeliness of being considered as your potential customers begin to align their needs with your solutions. Once we have helped establish situational alignment between your solutions and the key decision-maker needs, your sales team can take over. In doing so, they will be armed with all the detailed information gathered during all our previous discussions.